This summer a collaboration between SUPERFLEX and Cornwall’s St Austell Brewery will produce FREE BEER (version 3.2), launching at Tate St Ives, as part of the exhibition “social systems” organised by ProjectBase and taking place across the county. The new Cornish FREE BEER will be brewed with Cornish spring water from the Brewery’s private well and created with premium Maris Otter barley, grown locally in Cornish fields. 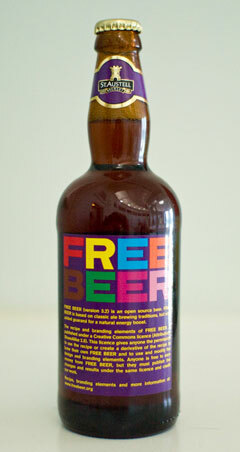 Tate St Ives, Tate Britain, Tate Liverpool and Tate modern will have the new beer available for sale until September and will launch FREE BEER with a challenge to the ‘grey matter’ when ProjectBase hosts the FREE BEER Cornish International All-Comers Pub Quiz Challenge on Sunday 8 July at 7.30pm at Tate St Ives. Founded in 1851, St Austell Brewery is known to be one of the oldest businesses in Cornwall and is one of only 32 Independently Family Owned Brewers in the UK. The company brews four regular cask ales: Tribute, Tinners, IPA and HSD and are most famous for Tribute which now accounts for over 50% of their production. Tribute was voted the South West’s favourite beer in two recent awards. The company markets its real ales nationally which also includes two keg versions Cornish Cream and Duchy and the bottled beer range consists of HSD, Tribute, Admiral’s Ale and Clouded Yellow. The company is growing with total annual turnover in 2006 of £85 million. It owns 167 pubs and is the South West’s largest wholesale distributor of beer, wines and spirits, serving more than 2000 free trade accounts, from pubs, clubs, hotels and other licensed outlets in Cornwall, Devon, Somerset and Dorset. Voted UK Brewer of the Year 2006 by the British Guild of Beer Writers, Roger Ryman has been Head Brewer at St Austell Brewery since 1999 and when he joined he was the UK’s youngest Head Brewer. Formerly of McClays Brewery, Roger moved from the most northerly family brewery to the most southerly.